Tickets go on sale to the general public beginning Friday, March 15th at 10 AM local time at the Hartman Arena Box Office or ticketmaster.com. Citi is the official presale credit card for the tour. As such, Citi cardmembers will have access to purchase presale tickets beginning Tuesday, March 12th at 10 AM local time until Thursday, March 14th at 10 PM local time through Citi’s Private Pass program. For complete presale details visit www.citiprivatepass.com. 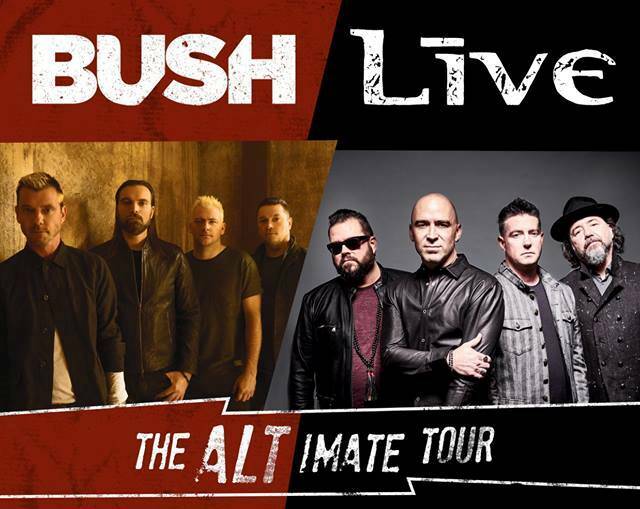 Artist presales are also available now through Thursday, March 14th at 10 PM local time, visit http://bushofficial.com/tour or http://freaks4live.com/home.html. +LIVE+, the multi-platinum band from Pennsylvania–Ed Kowalczyk (vocals, guitar), Chad Taylor (guitar, backing vocals), Patrick Dahlheimer (bass) and Chad Gracey (drums, percussion)–have sold over 22 million albums worldwide and earned two number one albums (Throwing Copper, Secret Samadhi). Their catalog is filled with such gems as “Lightning Crashes,” “I Alone,” “All Over You,” and “Lakini’s Juice,” which live on today as classics at rock radio. Throwing Copper—which is being celebrated in 2019 with a new deluxe 25th anniversary edition via Radioactive/Geffen/Ume–produced the band’s biggest single, “Lightning Crashes,” which was #1 at Modern Rock radio for 10 consecutive weeks. Throwing Copper reached #1 on the Billboard Top 200 and eventually surpassed sales of 10 million albums sold with Rolling Stone honoring the album with placement on their list, “1994: The 40 Best Records From Mainstream Alternative’s Greatest Year.” Secret Samadhi (1997) immediately shot to #1 on the Billboard Top 200 and eventually went double platinum. The release of the platinum-selling The Distance to Here (1999) turned +LIVE+ into an international powerhouse and moved the band from arenas into stadiums. +LIVE+ has been and remains today a global concert juggernaut. The band released an acclaimed five-song EP in 2018, LOCAL 717, their first new music in over a decade.